Summer is a great time to fall into a "Big Yarn" kind of book, which I define as an absorbing story with a strong, coherent plot, fully-developed characters, drama, a reasonable tempo, and at least a few thought-provoking ideas. To me, Big Yarns offer more plot then philosophy and don't get experimental with structure or language. My general definition excludes genre novels, like thrillers, which can be absorbing page-turners, but (with exceptions) tend to lack fully-developed characters and thought-provoking ideas. I also think of books that appeal to readers of both sexes and most ages. In my mind, The Count of Monte Cristo is the grand daddy of all Big Yarns. Most Dickens books and many other 19th Century novels also qualify. In making this list, I realized just how much I enjoy Big Yarns, because I reviewed all of them. There are times when a full-sized book list is just too much; when the Top 100, a Big Read, or all the Prize winners seem like too daunting an effort. That's when a short little list of books grouped by theme may be just the ticket. 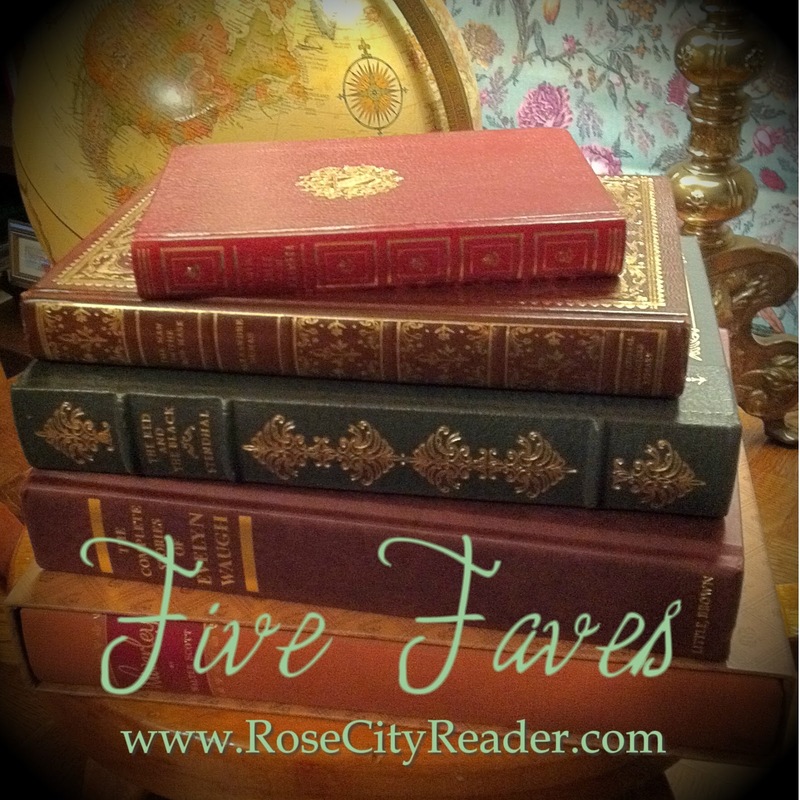 Inspired by Nancy Pearl's "Companion Reads" chapter in Book Lust – themed clusters of books on subjects as diverse as Bigfoot and Vietnam – I decided to start occasionally posting lists of five books grouped by topic or theme. I call these posts my Five Faves. Feel free to grab the button and play along. Use today's theme or come up with your own. If you post about it, please link back to here and leave the link to your post in a comment. If you want to participate but don't have a blog or don't feel like posting, please share your list in a comment. This is interesting to me. I think of Big Yarns as a winter thing.